and model number for future reference. Hyvox Ingenious Home Collection of products. your day with easy sandwich making. 4 bread, 2 sandwich slice capacity. mentioned below should be followed. plug or sandwich maker into water or any other liquid. Do not use the appliance for unintended use. on or taking off parts and before cleaning the appliance. or electrical or mechanical adjustment. if recommended by the appliance manufacturer. counter, or touch hot surfaces. near or below combustible material such as curtains. HYVOX Sandwich Maker User Manual 03. Do not immerse in water or any liquid. Here we explain to you the various parts of the Sandwich Maker. HYVOX Sandwich Maker User Manual 05.
sandwich making instructions and guidelines. with a piece of damp cloth, dry cloth or tissue. Fit the plug into the socket. the temperature indicator light (the green one) will be on. the bottom half with the buttered side against the plate. Fill the sandwich, pressing the bottom half into the plate. up and carefully close the two parts of the toaster together. with hot surface and steam. right temperature – cook only with metal plates closed. this may damage the non-sticking coating. After use, remove the plug from the socket. HYVOX Sandwich Maker User Manual 07.
it does not tamper the unit, however we offer you some suggestions. Flavored butter may also be used. the outside surface of the bread. cress, stuffed olive halves onion, tomato, etc. it. There are no user serviceable parts. socket and wait for the appliance to cool down. roll, absorbent paper towel or a soft cloth. when the filling is softened. 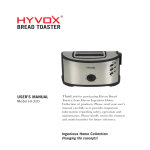 HYVOX Sandwich Maker User Manual 09.
maintain this product or damages caused by natural disaster or acts of war. the warranty period, Hyvox with its discretion will replace it for a new unit. Send us your valuable suggestions and feedback. purchasing Hyvox Sandwich Maker, your Ingenious Home Collection. life concepts!’ are registered trademarks of Hyvox Inc., Ontario, Canada. Copyright © Hyvox Inc. 2005. E&OE.